Down a rabbit hole of a nondescript liquor store on a nondescript street is a trove full of jewel colored bottles. 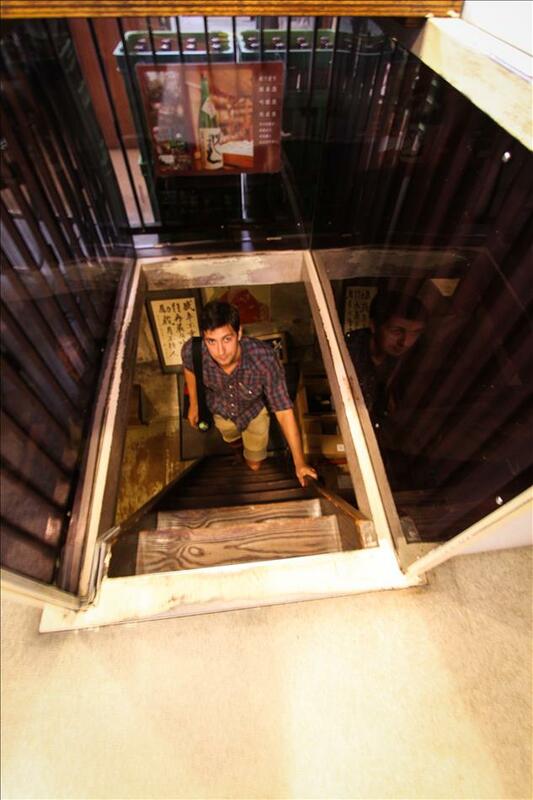 If you bow and speak words “sake tasting” at the store named Shimada Shoten you’ll be led down in to the depths of a vast rice wine cellar for an adventure in delicious rice wine. I had followed a treasure map found in the forgotten vaults of Google, spoken the words, and was down said rabbit hole. Here is where my adventure began. 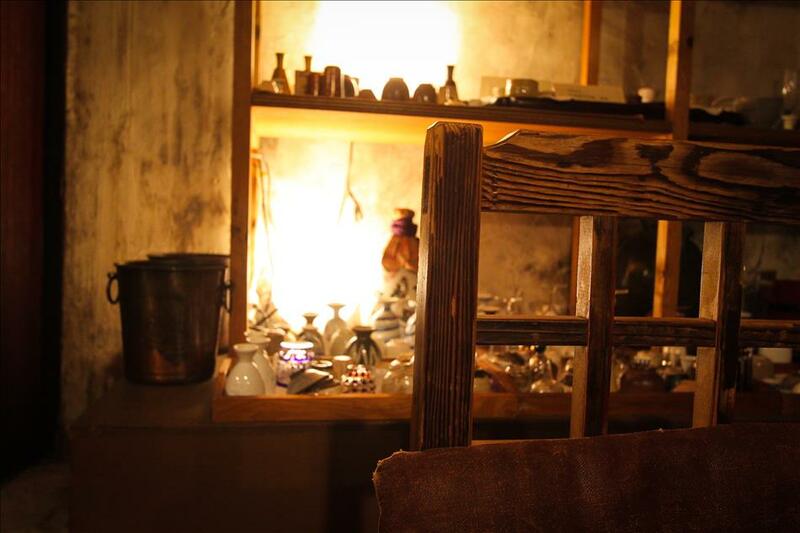 I took a seat at one of the two large round wooden tables between some businessmen unwinding and exchanging banter among one another in the cellar. Vintage leather bound books occupied a shelf in one corner and pairs of sake glasses of every imaginable shape and size occupied another as if collected for a mad tea party on Noah’s ark. 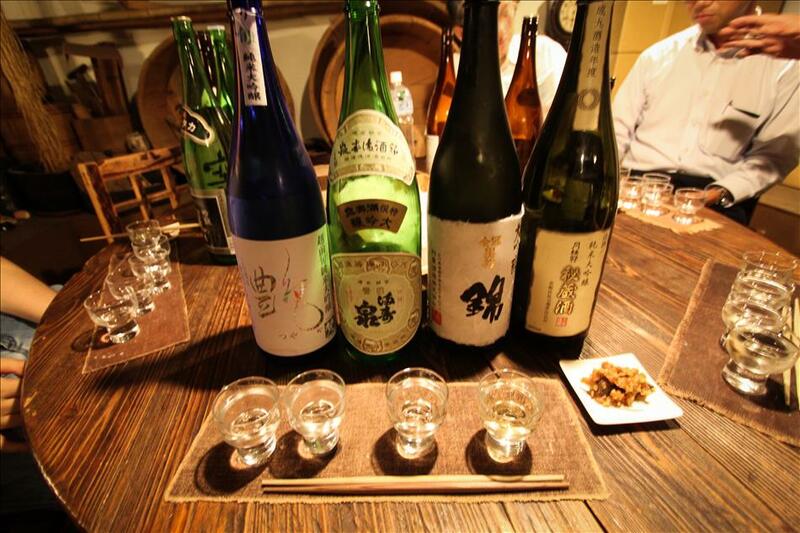 Four fruity flavored sake were presented, one bottle was nearly as old as me. Each glass bore the humble price of 210 yen or about 2 dollars. I happily sampled the drink that permeates so much of Japanese culture from celebrations to business deals as the host served me special glasses to taste the different sake in. Each was tailored in size, shape, and materials to enhance the notes of the wine. They ranged from bowl like ceramic to dainty porcelain saucers, to colorful blown glass. The flavors biting at my taste buds were complimented by homemade chunky miso in a sort of Asian wine and cheese combination that was beyond delicious. Minutes ticked by and the wine in my glasses waned until they were empty. I was a little worried about the steep ascent out of the rabbit hole and bask into reality, not quite ready to leave the cozy wooden den that served as an oasis of Japanese ambrosia. My Cheshire Cat whose grin had significantly widened in the past hour reminded me that a spectrum of sushi awaited me on the other side of paradise and I climbed the Hillary steps out of the cellar, bowing and saying “Arigato” many times in thanks for being let in on one of Osaka’s best kept little secrets. Hi there, I am interested to go here too on my trip to osaka from 31 jan to 3 jan 15. Do you have the address and a contact (email?) that I can utilise to ask if they would be open during that period? Thank you!